House Speaker Joe Aresimowicz and Minority Leader Themis Klarides during last year’s session. The top Democrat in the House of Representatives asked his Republican counterparts Tuesday to abandon their longstanding practice of issuing a GOP budget this spring. With just under one month left before lawmakers leave the Capitol — most to run for re-election — Speaker Joe Aresimowicz, D-Berlin, said both parties should focus only on a bipartisan plan to rebalance finances this fiscal year and next. But House Minority Leader Themis Klarides, R-Derby, said Republicans won’t forfeit their option to bring their fiscal proposals directly to the public. Were it not for numerous GOP fiscal plans made public, she added, last year’s nine-month-long budget debate might still not be over. At issue are two holes in the bipartisan, two-year state budget enacted late last October. The current fiscal year’s General Fund is on pace to finish June 30 nearly $200 million in deficit. With just $210 million in the state’s emergency reserves and neither party inclined to raise taxes in a state election year, there is little margin for error. And fiscal analysts say the preliminary budget for 2018-19, unless adjusted, will run about $265 million in deficit. The speaker said if either party wants to hold a press conference to discuss one or a few specific ideas, that’s fine. But if the GOP releases a comprehensive budget specifically to demonstrate how they would manage finances differently from the Democrats, he added, that serves no purpose. Why are partisan budgets useless this year? 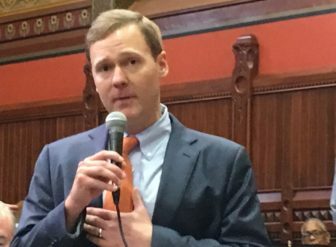 The speaker and House Majority Leader Matt Ritter, D-Hartford, suggest several reasons. Both parties really need good news later this month. The hope is that shortly after the April 17 deadline for state income tax filings has passed, analysts will upgrade expectations for revenues, for both this fiscal year and next. Mitigating or suspending entirely new restrictions on the Medicare Savings Program. Those restrictions, which could limit prescription medication benefits for as many as 113,000 poor seniors and the disabled, originally were scheduled to start in January, but then were deferred to July 1. Reducing the amount of savings they directed Gov. Dannel P. Malloy to find once the budget is in force. Malloy, who was ordered to achieve unprecedented savings this fiscal year — and would have to find even more under the preliminary budget for 2018-19 — frustrated lawmakers by withholding $91 million in municipal aid. Keeping the cap on municipal tax rates on motor vehicles at 39 mills. Unless the 2018-19 budget is adjusted, that rate will climb to 45 mills. Ritter added that with the House narrowly split 79-71 and the Senate divided evenly, the only chance for anything to get done is through bipartisan cooperation. “If people are just throwing rehashed proposals out there, then, to me, that is just a political issue,” he said. Republican leaders have said since the session began in early February they still intend to release their own plan to the public. Klarides said Tuesday that nothing has changed. “I appreciate his (Aresimowicz’s) opinion, but we can’t get to a bipartisan budget unless we start out with all four caucuses (developing) individual ideas,” Klarides said. But does the GOP want to share those ideas directly with the voters? 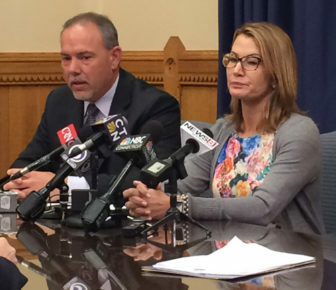 Many Democratic legislators anticipate a Republican budget proposal would include a proposal to cut state employee benefits after June 30, 2027 — when the current benefits contract expires — but reap some of the savings now. Republicans offered that proposal on several occasions in 2017. Malloy, many Democratic lawmakers, and union leaders all insist this would be illegal. GOP leaders disagree.